P.Q. PHAN was born in 1962 in Vietnam. He became interested in music while studying architecture in 1978 and taught himself to play the piano, compose, and orchestrate. In 1982, he immigrated to The United States and began his formal musical training. He earned his BM from University of Southern California and his DMA in Composition from University of Michigan. P.Q. Phan has written a large variety of genres including symphonies, chamber music, song cycles, and opera. Phan's music has been performed throughout the United States, Canada, Mexico, in Europe (England, France, Austria, Italy, Holland, Norway, Germany, Belgium, Spain, Estonia, Lithuania, Russia, Denmark, etc.,... ), Israel, Turkey, Australia, New Zealand, China, Hong Kong, Singapore, Korea, and Japan. 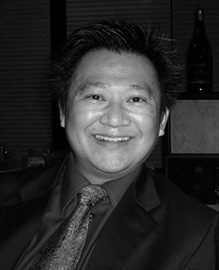 Mr. Phan has received numerous commissions, including from the Kronos Quartet (3), the American Composers Orchestra, Ensemble Alternance, the Cleveland Chamber Symphony (2), the Greater East Lansing Symphony, the Pittsburgh New Music Ensemble (2), the Samaris Piano Trio, the First Music 8 - New York Youth Symphony, La Sierra University, trombonist David Taylor, the Deknatel Consort, William Albright, oboist Harry Sargous, etc. His works have been performed by the Kronos Quartet, the BBC Scottish Symphony Orchestra, the Radio France, Ensemble Modern, the American Composers Orchestra, the Cincinnati Orchestra, the St. Louis Orchestra - Chamber Group, the Cleveland Chamber Symphony, the Charleston Symphony, the Greater East Lansing Symphony, the Sinfonia da Camera, Pittsburgh New Music Ensemble, Society for New Music, the New York Youth Symphony, etc. Phan has received a Rome Prize, ASCAP Standard Awards (1990-present), '95 Ohio Arts Council Individual Artist Fellowships, Charles Ives Center for American Music, the Concordia Orchestra, and residencies at the MacDowell Colony. He was a guest composer at several music festivals, including the Asian New Music Festival in October '99 in Tokyo - Japan, the New Music Festival at Hamilton College (New York) in April '97 and April '99, the '96 residency with the Kronos Quartet at Univ. of Iowa - Hancher Auditorium, the '95 Asian Composers' Forum in Sendai - Japan, the '94 New Music Festival at UC Santa Barbara, the '92 Music Lives in Pittsburgh, etc. His recorded works include Tragedy at the Opera ("Kronos Quartet: 25 Years" , Nonesuch 19504), Nights of Memory for solo guitar (Michael McCormick, Plaxton - CD001, L.A., 1992), and a CD titled "Banana Trumpet Games" (includes Unexpected Desire, Banana Trumpets Games, My Language, Rough Trax, Beyond the Mountains, and Rock Blood) on CRI. His upcoming CD will include AC/DC, Movement, From Perseus Cluster, and Kaleidosonicon. He is currently an Associate Professor in composition at Indiana University, Jacobs School of Music. He had previously taught at University of Illinois at Urbana Champaign and Cleveland State University.